Austin, Texas, March 8, 2013 – MakerBot® surprised the world today with a major announcement at SXSW Interactive announcing development of the new MakerBot Digitizer Desktop 3D Scanner prototype. The MakerBot Digitizer Desktop 3D Scanner adds to MakerBot’s 3D Ecosystem that includes MakerBot Replicator 3D Printers, the MakerBot Store, Thingiverse.com, MakerWare, MakerCare, and the apps inside Thingiverse, including the popular Customizer app. 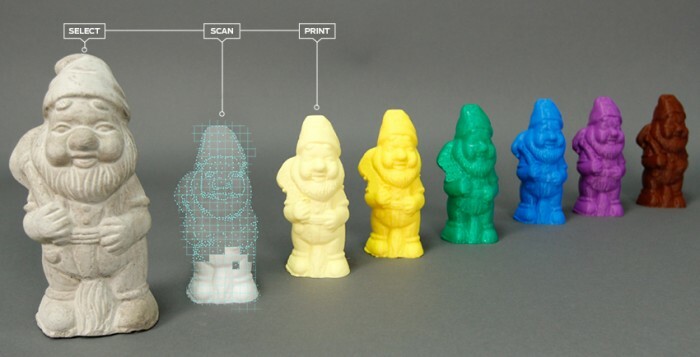 Now, with the announcement that MakerBot is developing a MakerBot Digitizer Desktop 3D Scanner, MakerBot wants to know – what will you digitize? The MakerBot Digitizer Desktop 3D Scanner shown at SXSW is a prototype model and MakerBot will spend time testing, scanning, and 3D printing the items scanned with it. “We are super excited to announce at SXSW Interactive that we are developing the MakerBot Digitizer Desktop 3D Scanner,” said Bre Pettis, CEO of MakerBot. “It’s a natural progression for us to create a product that makes 3D printing even easier. With the MakerBot Digitizer Desktop 3D Scanner, now everyone will be able to scan a physical item, digitize it, and print it in 3D – with little or no design experience.” MakerBot, the global leader in 3D printing, is believed to be the only company to ever announce a physical hardware product at SXSW Interactive. Bre Pettis, CEO of MakerBot, first announced MakerBot’s first generation 3D printer, the Cupcake CNC Desktop 3D Printer, four years ago at SXSW in Austin. MakerBot released its fourth generation desktop 3D printer last fall with the introduction of the MakerBot® Replicator® 2 Desktop 3D Printer, and its sibling this January, the MakerBot® Replicator® 2X Experimental 3D Printer, at CES 2013. This year, Pettis delivered the Opening Remarks for SXSW and delighted SXSW Interactive attendees with the announcement that MakerBot will develop and market a companion to MakerBot’s Replicator 2 Desktop 3D Printer, the MakerBot Digitizer Desktop 3D Scanner. Pettis noted, “The MakerBot Digitizer Desktop 3D Scanner is an innovative new way to take a physical object, scan it, and create a digital file – without any design, CAD software or 3D modeling experience at all – and then print the item again and again on a MakerBot Replicator 2 or MakerBot Replicator 2X Experimental 3D Printer.” This exciting new technology uses lasers and cameras to replicate physical objects into a digital form and file. “This is something you would envision being science fiction, but in fact, it is real – and it is so cool,” Pettis went on to note. “The MakerBot Digitizer Desktop 3D Scanner is a great tool for archiving, prototyping, replicating, and digitizing prototypes, models, parts, artifacts, artwork, sculptures, clay figures, jewelry, etc. If something gets broken, you can just scan it and print it again.” MakerBot anticipates that the MakerBot Digitizer Desktop 3D Scanner will be used mostly by those who have dreamed of being able to scan a physical object and then print it in 3D. MakerBot sees the MakerBot Digitizer Desktop 3D Scanner being used in businesses, universities, classrooms, and in the home where anything 3D can be digitized and reproduced at will. The MakerBot Digitizer Desktop 3D Scanner is setting the standard in 3D scanning and is a new addition to MakerBot’s Ecosystem. To learn more, visit www.makerbot.com/digitizer. About MakerBot Founded in 2009, Brooklyn-based MakerBot has grown to be a global leader in desktop 3D printing. MakerBot had 16 percent market share of all 3D printers (industrial and personal) made from 2009 to the end of 2011. In 2011, MakerBot had 21.6 percent market share. In 2012, MakerBot estimates that it now has a 25 percent market share of the 3D printer market. There are more than 15,000 MakerBot Desktop 3D Printers in use by engineers, designers, researchers, and people who just like to make things. The MakerBot Replicator Desktop 3D Printer has been named Popular Mechanics “Overall Winner” for best 3D printer and was honored as one of Time Magazine’s Best Inventions of 2012. In addition, MakerBot was named “Best Emerging Tech” at the 2012 Consumer Electronics Show, won Popular Mechanics Editor’s Choice Award, the Popular Science Product of the Year, and recently was awarded the Fast Company 2012 Innovation by Design Award as well as being named by Fast Company as “One of the World’s Top 10 Most Innovative Companies in Consumer Electronics.” And MakerBot was recently awarded a TechCrunch Crunchies Award for best hardware start-up. The company has been featured in The New York Times, The Wall Street Journal, the Economist, Wired, The Colbert Report, Fast Company, Engadget, Make: Magazine, Rolling Stone, Time.com, IEEE Spectrum, CNN, Financial Times, NPR, Vogue Italia and many others.